Iffn ya’ll got an ol’d manual typewriter hangin’ about, here’s a worthy project to retire it to! 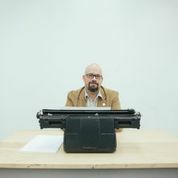 ACAD Liberal Studies Instructor Derek Beaulieu is planning to teach his students how to type. Starting in January, every student in Beaulieu’s Creative Writing course will be required to create all of their notes, their assignments and their final projects on portable manual typewriters. Students will be required to write in class, in coffee houses and on public transit in order to make traditional poetry and prose, but also to use the typewriters to create portraits and music — all in order to explore the artistic possibilities of these sadly neglected machines. In order to bring these ideas to his students, Beaulieu is seeking the donation of 35 portable, manual typewriters in working condition. Robert Archambeau at Samizdat blog presents some chewy gists on rhyme served up at a recent mini-conference. As Ezra Pound wrote Louis Dudek: “C/vn not a one man job.” Happily, readers other than my lone self appreciate the writing of Michael Heller, and Eric Hoffman has reviewed Heller’s collected poems, which review is readable at the link!